Da Capo Press, 9780306821455, 432pp. Iron Man chronicles the story of both pioneering guitarist Tony Iommi and legendary band Black Sabbath, dubbed "The Beatles of heavy metal" by Rolling Stone. 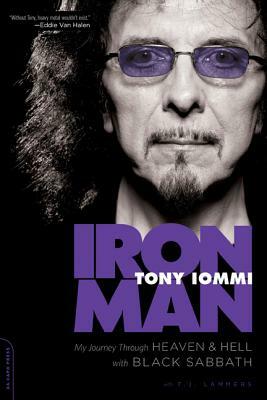 Iron Man reveals the man behind the icon yet still captures Iommi's humor, intelligence, and warmth. He speaks honestly and unflinchingly about his rough-and-tumble childhood, the accident that almost ended his career, his failed marriages, personal tragedies, battles with addiction, band mates, famous friends, newfound daughter, and the ups and downs of his life as an artist. Tony Iommi is a cofounding member and lead guitarist of Black Sabbath and is among the most influential guitarists of all time. Born in 1948, he lives in Birmingham, England. “[Black Sabbath’s] interactions with other famous music personalities and Tony Iommi's perceptions of the music world make this a 'must' for fans of the group and any collection profiling rock music history."